We know how important tree planting is to the environment and to our children's future, this is your chance to plant some trees through us. We'll be organising tree planting days at the end of Feb / early March so you'll have the chance to plant your own trees. The woodland will also be accessible to the public as it's on the public loop walk route we are developing right now. Last year a lot of you helped us grow our woodland by sponsoring the planting of an additional 1500 trees to replace the losses. This year we are going to plant another 600+, it's been a hard year for trees young and old with the very wet winter and early spring followed by a 6 week drought. This year we are introducing 100 Whitebeam to provide good shelter, they are salt and wind hardy and should really help in the exposed top field. 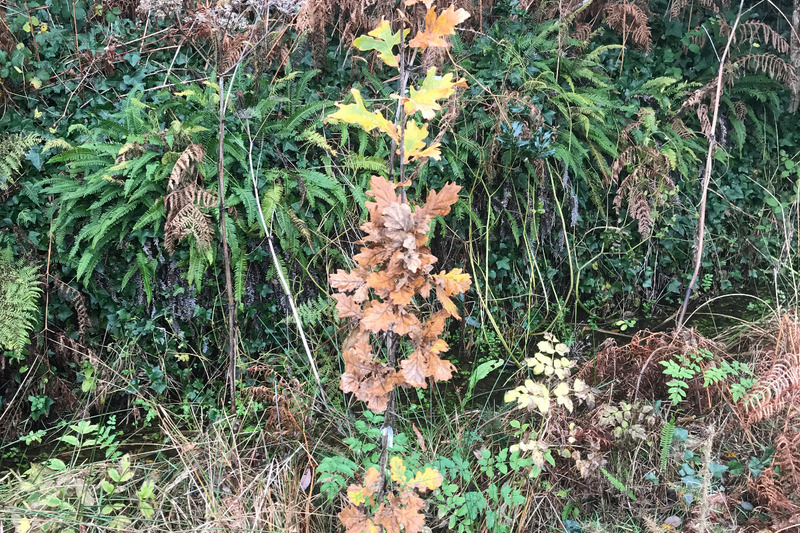 We are also going to plant 100 Pedunculate Oak the kind of Oak tree that dominated Ireland's ancient forests though it's not as hardy as the Sessile Oak we have planted around 3500 of. The other varieties are 100 Sessile Oak, and 200 Common Alder, last years have done very well in the wetter areas. 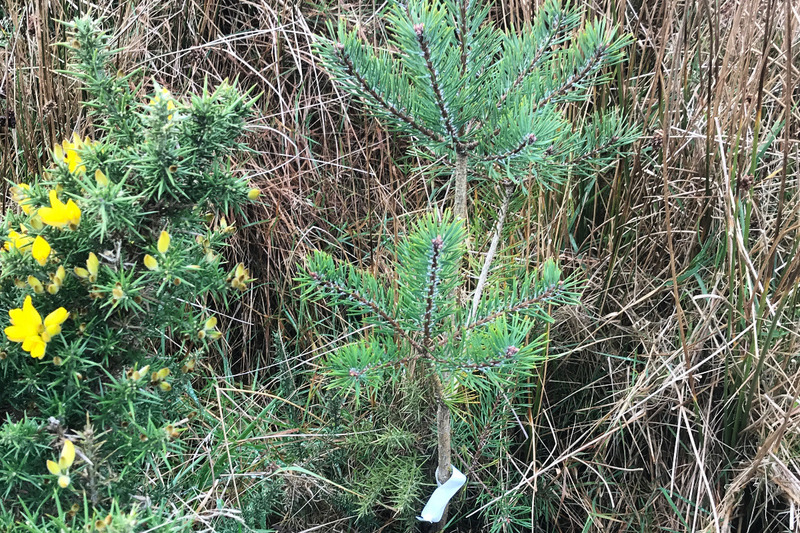 These trees will cost on average €5 to purchase, plant and maintain over the first few years, we have to purchase them now but hopefully we will be reimbursed following final sign off though on a site like ours there is no guarantee. If you're a business you can get involved too we'll add you to our list of sponsors. We are creating a place to stay, to relax, a place to have adventures and to learn, for some a place just 'to be'. • To improve the biodiversity and the environment in which we are working and to help people to understand it's importance. • To help build healthy, resilient, communities. 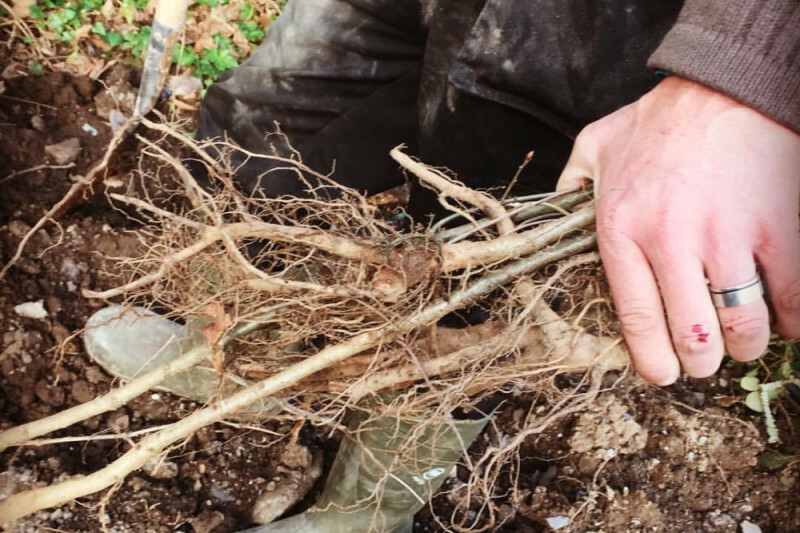 Winter 2016/17 we planted a Native Woodland of almost 8000 Oak, Alder, Holly, Hawthorn, Hazel, Birch and Scots Pine. This was established through grant aid from The Native Woodland Scheme administered by The Forest Service. 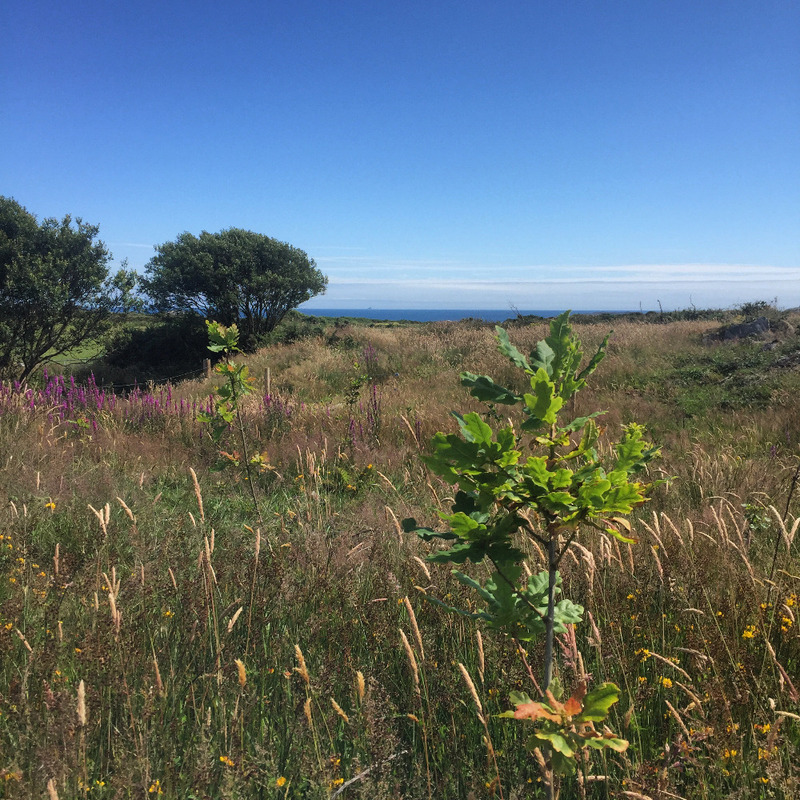 However these first 5 years are crucial to help the trees establish themselves and it is up to us to carry out maintenance, keeping the areas around the trees clear, labeling, creating paths and generally monitoring their progress. As expected we lost about 20% in the first season around 1500 trees, which we replaced with a lot of help from you. Sponsor 10 trees and we'll send you a 50% off voucher for one of our Mizen Adventures or Wild Nights Out activities or Bike Hire. Sponsor 100 trees and we'll send you a €50 off voucher for a stay with us. We need your help a.s.a.p. so that we can secure the trees for planting this winter. Our mission is to help people re-engage with the natural world and all it has to offer. We believe it’s time to get kids (and adults) away from their screens, out of the virtual world and into the real world! The way we live now has insulated us from our natural environment; we have lost touch with the wonders of nature at our fingertips. Our site, a 38-acre Organic coastal farm, gives us a unique opportunity to do this. We will be offering accommodation, including 6m Geodesic Domes on decks nestled amongst rock formations on the edge of the Atlantic, which offer the best of luxury and unrivalled views. We believe that when our customers stay in a comfortable, attractive structure so close to nature, eat the best of organic, local produce and partake in activities that satisfy their need for excitement and knowledge, they will return home with a greater understanding and appreciation of our environment. Our planned activities will aim to re-connect our customers with the natural world. 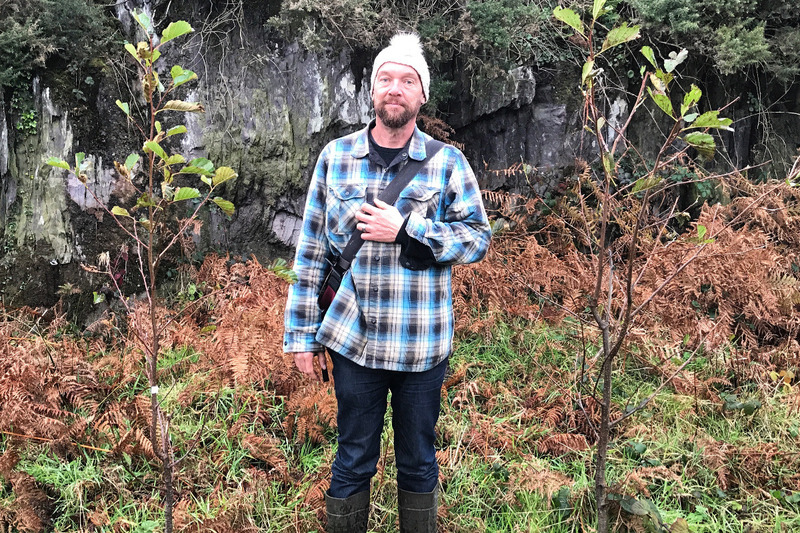 We will go foraging for seaweed in nearby coves via kayak with an expert who will tell you which species have medicinal properties and which are good for cooking. Then we’ll return to our base and be cooking with dried versions of what’s been gathered. We will offer Forest School based kids’ camps, bushcraft survival weekends, bike packing, Organic gardening courses along with Environmental education for schools and groups. 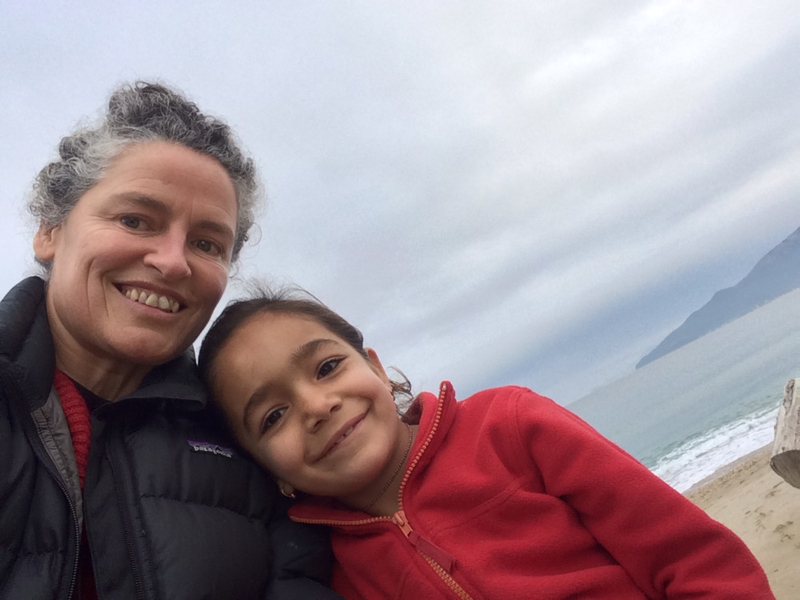 Co founder Melanie is a bodywork practitioner. She recently went out to Greece to work with Yazidi refugees who had made the long, dangerous journey from Iraq to escape the ongoing Genocide by ISIS, she has also taught massage in various settings in Africa enhancing Women’s prospects at making a sustainable living. The fast growing youth mental health crisis that has touched so many of our lives is something we would like to try and help address. Research tells us that many of those in crisis have lost the ability to talk one to one in the "real world" having spent so much of their time lost in their screens on line. It also tells us that we have a generation of individuals that suffer anxiety about not being in control of their own lives. Most children now do not play unsupervised in the way that many of us did, after school they often go to sports, dance, music classes that are still supervised by adults. We believe our children need to build up their confidence by learning and playing together. Through our Wilderness Education we will give them the opportunity to make shelters, build rafts and fires under supervision by our instructors but allowing them to find solutions as individuals and as team. For others we will offer a place of refuge and learning for others in need, a place just "to be" where they can re-connect with nature and most importantly with themselves, then in time maybe they will feel like picking up a fork and helping us in our Organic vegetable garden or help label a few trees. But if they don't that's fine too. We are also creating a harbourside public walk that will, in time, return to the village through the emerging, woodland. By sponsoring our trees you will become part of our community, helping us with our work, directly helping us grow our woodland. It will be a great benefit to the migrating sea birds we receive every year and in our teaching about the natural environment. Another 150 Common Oaks planted today to go with the 100 Whitebeam last week. Thank you sponsors ! Last chance to sponsor our woodland - We've started planting the trees with more on order. Thanks for all your support! 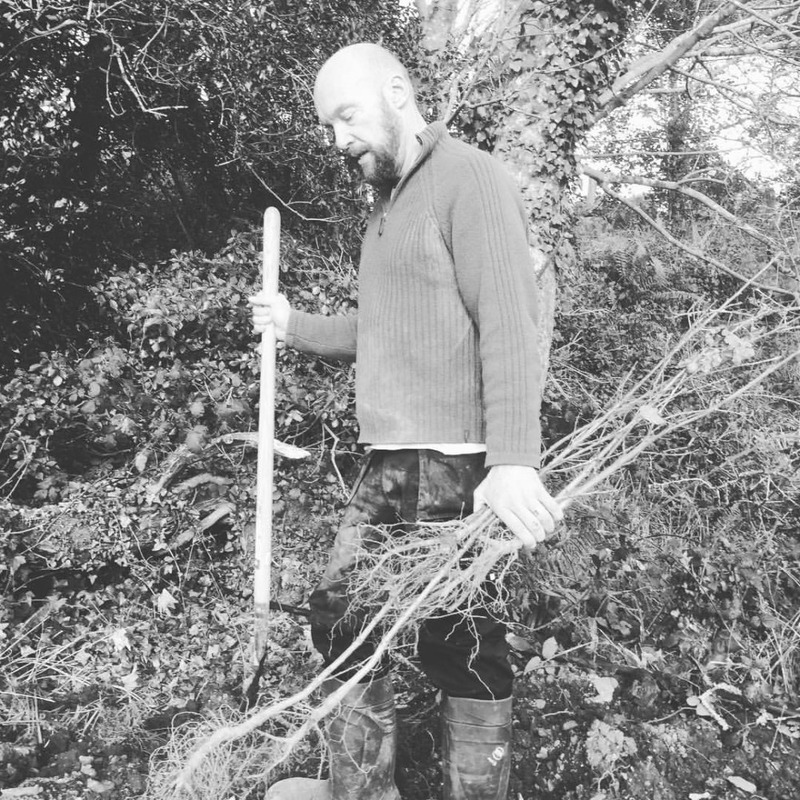 If you're a West Cork business wishing to offset some of your carbon emissions through tree planting now's your chance to get involved with a local project! We will add you to our list of supporters. Last year a lot of you helped us grow our woodland by sponsoring the planting of an additional 1500 trees to replace the losses. This year we are going to plant another 600+, it’s been a hard year for trees young and old with the very wet winter and early spring followed by a 6 week drought. This year we are introducing 100 Whitebeam to provide good shelter, they are salt and wind hardy and should really help in the exposed top field. 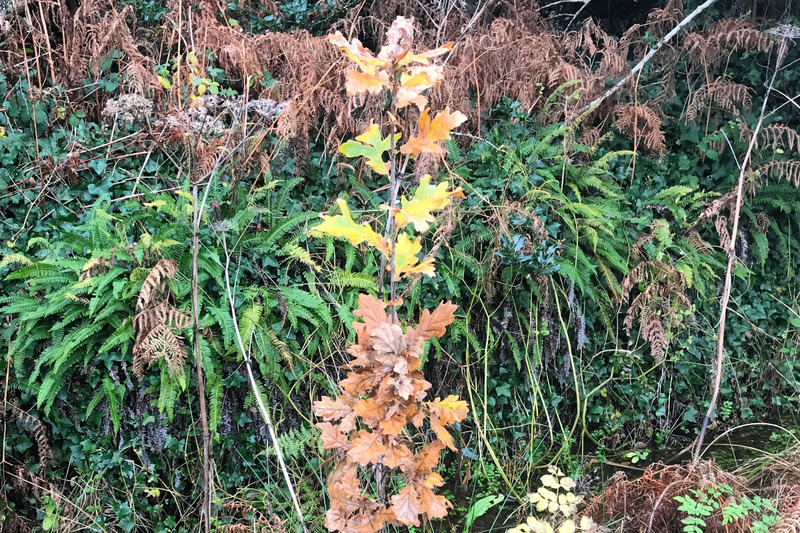 We are also going to plant 100 Pedunculate Oak the kind of Oak tree that dominated Ireland’s ancient forests though it’s not as hardy as the Sessile Oak we have planted around 3500 of. The other varieties are 100 Sessile Oak, and 200 Common Alder, last years have done very well in the wetter areas. Sponsor 1 tree and we will add your name to our "Supporters Wall" which will be sited in our main building when constructed. Sponsor 3 trees and we will add your name to our "Supporters Wall" plus mail you a voucher for €5 off Bike Hire or any of our activities. Sponsor 5 trees and we will add your name to our "Supporters Wall" plus we will send you a €10 off voucher for any of our activities or bike hire. 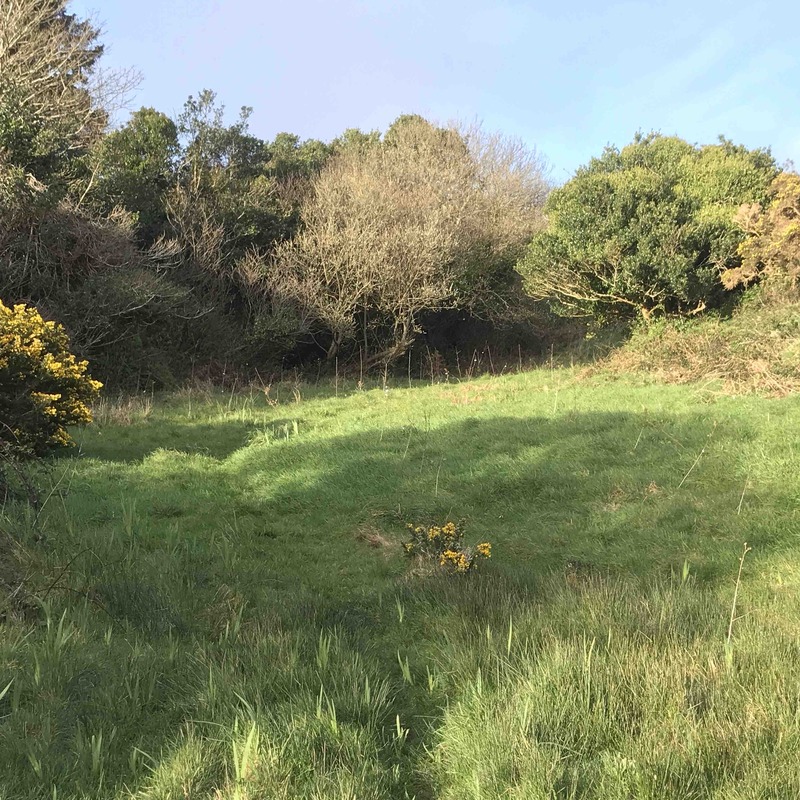 Sponsor 10 trees and we will add your name to our "Supporters Wall" plus mailing you a €25 off voucher for a stay on our beautiful coastal farm. Sponsor 20 trees and we will add your name to our "Supporters Wall" plus mail you a voucher for €50 off a luxury stay with us at Goleen Harbour Farm. Sponsor 30 trees and we will add your name to our "Supporters Wall" plus mail you a voucher for €75 off any of our activities or a luxury stay @ Goleen Harbour.